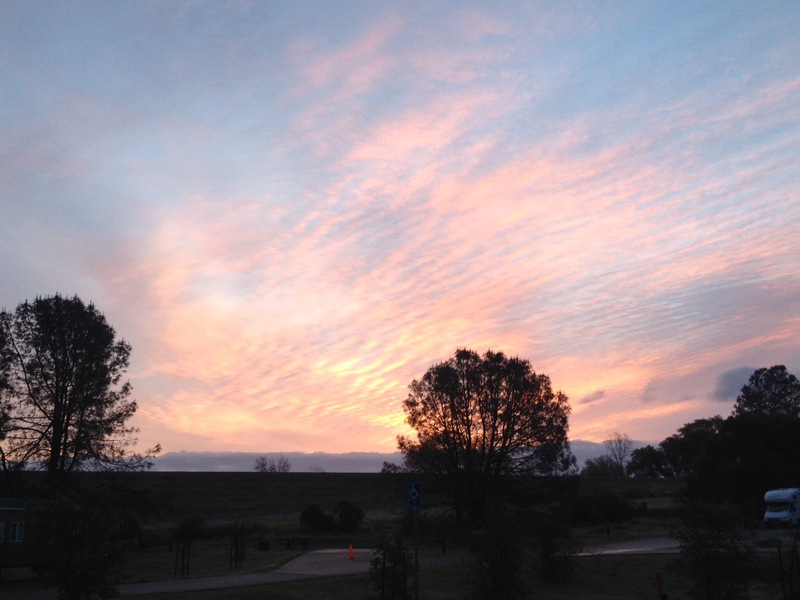 We saw a lovely sunrise as we left Folsom lake bound for Bakersfield, California. Like many of our stops on our trip down to Texas, Bakersfield was going to be a quick overnighter. We picked a well-reviewed park on the way out of town that had access to wifi and laundry. Priorities. 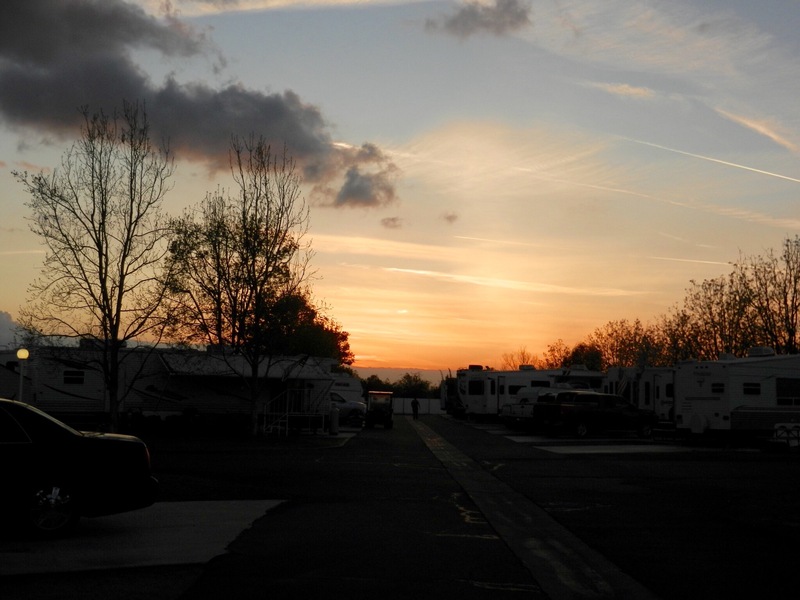 The park was called “A Country RV Park” and it lived up to its reviews. It was an exceptionally neat and tidy park with everything you would need for a stop over to clean up and replenish. Unfortuntatly, there isn’t much to do nearby. This park is probably the crowning jewel of Bakersfield. But all we really needed was to wash the graveyard of bugs off our windshield, do some laundry, and dry out. Mostly dry out. It seemed like everything we owned was full of water and we were ecstatic that it had finally stopped raining. When we got to Bakersfield we opened up every single exterior cabinet, pulled out all of our lawn chairs and carpets, and let everything take a moment to air out. Each spot was a pull through with full utilities and a nice grassy patch for your dog. 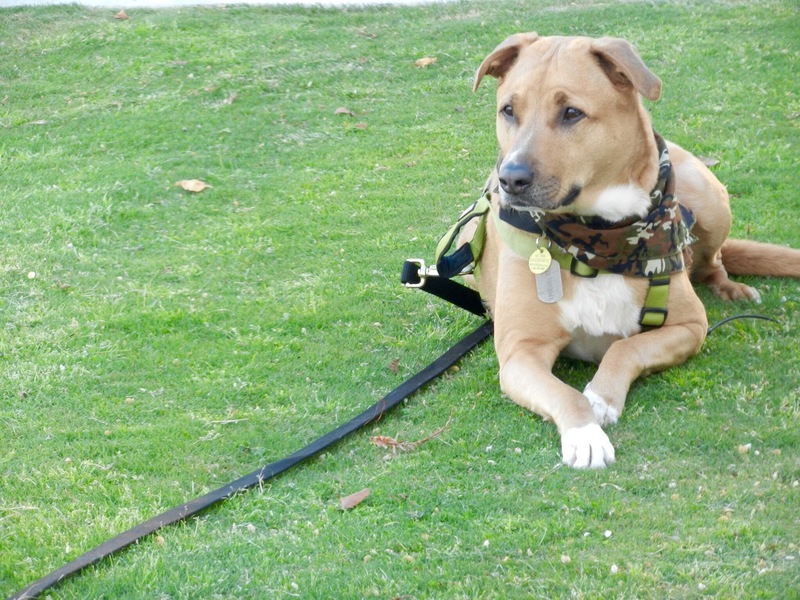 Did I mention that this park was the most pet friendly park we’ve found? Other than state parks, this is the first place we’ve found that didn’t have a limit on the number of pets. We’ve learned to just not mention the cats when we check in places . . .
Like I said, we desperatly needed to wash the bugs off of our windshield. All shiny and clean . . . for now. 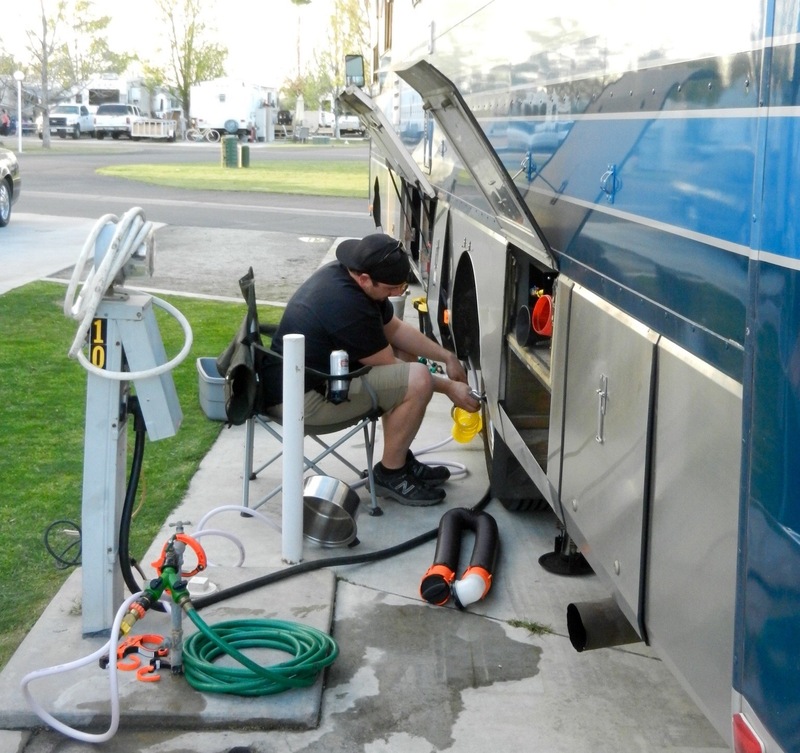 Brandon using his new air pump to check and adjust the pressure in the RV tires. We have a tire pressure monitoring system but since the system is new, Brandon is still monitoring its accuracy the old fashioned way. These photos are mostly for my Auntie Lyse, who once joked that this blog would be the story of us doing laundry at laundromats across the country. She requested pictures of each one. 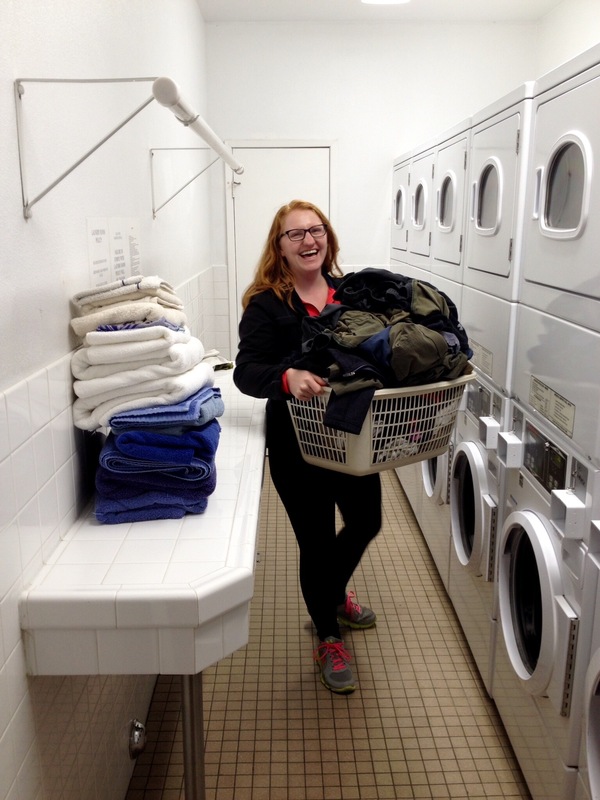 So here you go, Lyse, our first laundromat of the trip! 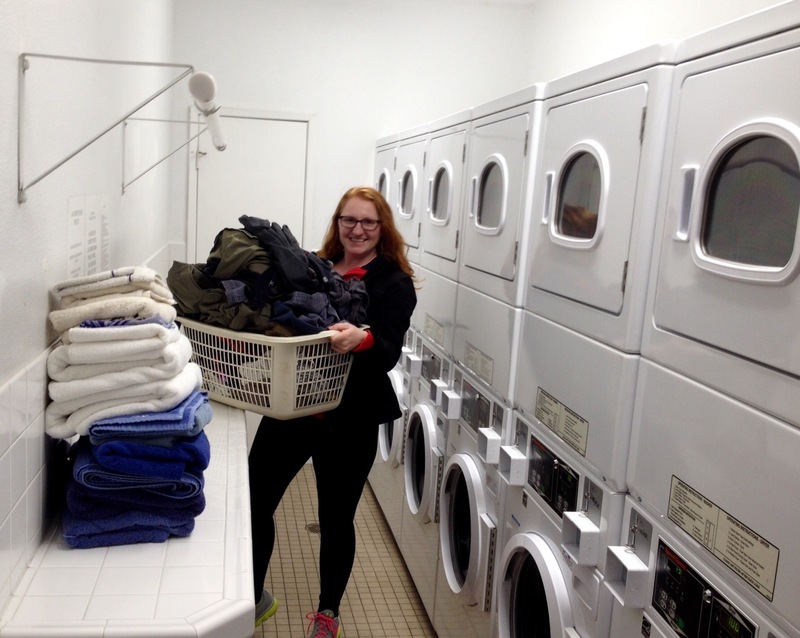 Laundry has never been so much fun! We did have one small hiccup on our way down to Bakersfield. We had the oil in the RV changed at a Camping World right before we left. The rig was there having a new couch put in, so we thought, why not. 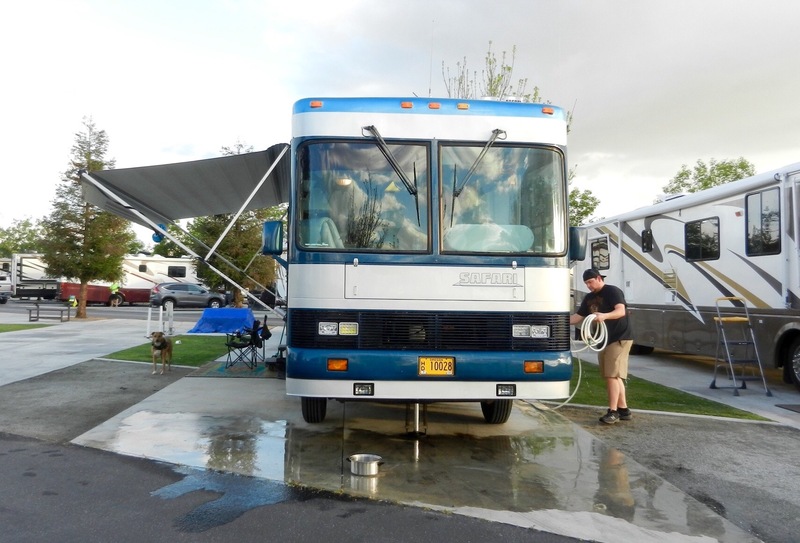 Well, when we went to leave Folsom Lake we noticed that we were leaking oil, and quickly. While I was running through all the catostrophic possibilites, Brandon identified that we were leaking from the oil filter and remembered that we had recently had our oil changed at Camping World. Something must not have put back correctly. I went to find the nearest Camping World and found that it was only 10 mintues away! It turned out that our particular motor takes an unusual type of filter and if the wrong filter is used the system does not seal correctly and the oil leaks out. When we got to Camping World and told them we were leaking oil following an oil change they took one look at our rig and said, “They used the wrong filter.” We were told that this problem recently came up at the very Camping World we were stopped at and had culminated in a company wide email notifying everyone of the problem. Apparently our local Portland stop missed the memo, but it all turned out okay. The shop in California replaced the filter, cleaned everything up, and topped up the oil for free. Plus, they saved the filter box label for us so that we can show it to every place we get the oil changed so we don’t have this problem twice! Tomorrow we are off for Needles, California to visit Pirates Cove Resort, a literal off-road playground on the Colorado River.